Perigord Noir (Black Perigord) is the most visited region of the Dordogne, and includes many of the sights that you will already have heard of. This part of the Perigord is the richest in terms of beautiful villages, magnificent castles, pre-historic cave paintings and caves rich in stalactites and stalagmites. It really is a wonderful area and well worth visiting. It is so rich in sites that it is worth splitting your visit into two parts: the southern part of Perigord Noir follows the Dordogne valley as it flows from east to west, passing beautiful villages and dramatic castles as it goes and the northern part which follows the valley of the River Vézère - European centre of prehistoric sites. The dordogne river in the Perigord Noir stretches from the lovely town of Saint Cyprien to and on to Carlux on the Lot/Dordogne border. Close to Saint Cyprien are the "most beautiful villages" of Beynac, Castelnaud-la-Chapelle, La Roque Gageac and Domme. A little further south is the most beautiful village of Belves. Along this same stretch of river are the magnificent castles of Beynac, Castelnaud, les Milandes, Montfort and the Chateau de Fenelon as well as the wonderful gardens of Marqueyssac, on the river near La Roque Gageac and the gardens of Eyrignac near Salignac. There are also some caves in this part of the Perigord Noir though most are along the Vezere valley. Along the Dordogne valley are the caves at Domme, and the troglodyte dwellings under the main square of Belves. 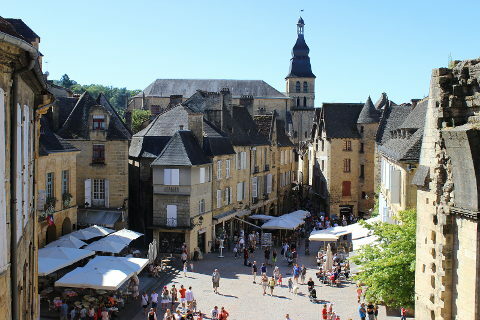 Of course the highlight of a trip to the Perigord Noir is the beautiful town of Sarlat, packed with history and beautiful buildings. 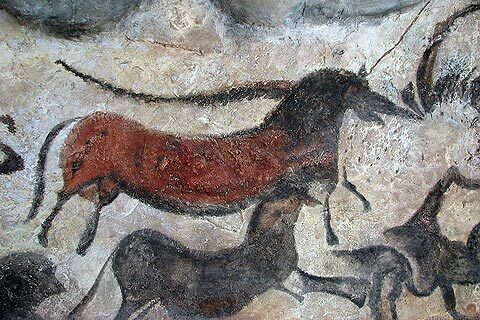 The Vezere Valley is UNESCO listed because of its enormous wealth in prehistoric paintings and dwellings. Amongst the prehistoric caves and shelters are the Lascaux Caves, the Roque Saint Christophe, Laugerie-Basse, the Grotte de Rouffignac, Font de Gaume and the Cavern of Bara Bahau. At Les Eyzies is the Musée de la Prehistoire. There are also the beautiful natural caves of the Grotte du Grand Roc and the Gouffre de Proumeyssac. The Vezere Valley also has the charming Chateau de Losse, the impressive Chateau de Commarque and the most beautiful villages of St-Leon-sur-Vezere and St-Amand-de-Coly. There are also the towns of Montignac, next to the Lascaux caves, and Terrasson with its attractive town and the lovely modern gardens - Les Jardins de l'Imaginaire. Close to the Perigord Noir in the Lot department are the attractive towns of Souillac and Martel as well as the historic and UNESCO listed Rocamadour. Also the most beautiful villages of Carennac, Autoire and Loubresac and the fabulous Gouffre de Padirac. The most beautiful village of Curemonte is not far from the Perigord Noir area and the countryside of the Correze is well worth a visit. The Perigord Noir is the most popular part of the Perigord area. For the other parts of the Perigord see: Perigord Pourpre, Perigord Vert and Perigord Blanc.